Broco® MINI-TAC Breaching Torch » Protective Solutions, Inc.
Broco® Mini-Tac Portable Breaching Torch Kit is the smallest, most portable exothermic torch kit on the market today. The MINI-TAC is used in situations when the operator must make a small number of strategic cuts to enable him to complete his objective. It is used by the U.S. Army, the FBI and other special units including the London Fire Brigade and Australian Navy. 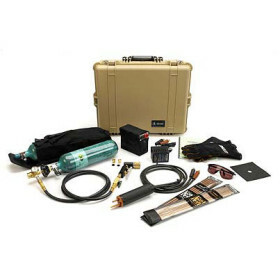 The MINI-TAC contains two oxygen cylinders, submersible oxygen regulator, torch, oxygen hose, 2-pole striker plate with cover, battery assembly with charger, 18" rod extender, Molle carry pouch, leather shield, protective gloves, safety glasses, sample packets of 3/8" and 1/4" diameter cutting rods, collets to fit 3/16", 1/4" and 3/8" cutting rods and a foamed storage case.